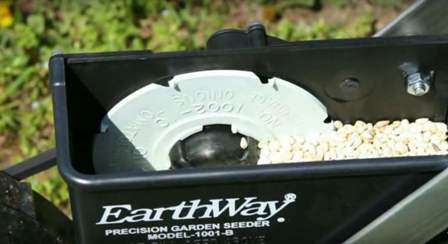 Earthway Precision Garden Seeder 1001 B Review | Effective and solid. 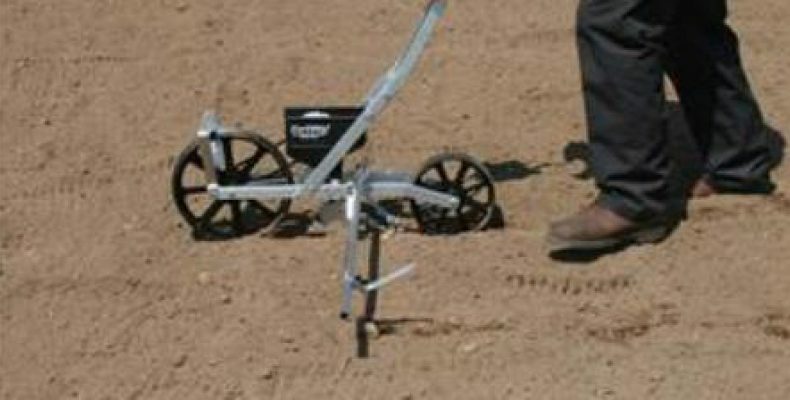 This little seeder is much like the Chapin 8701B garden seeder – in that it uses the same vertical seed plates with cups to capture the seeds and guide them into the seed chute. The Earthway Precision Garden Seeder 1001 B is not quite as heavy as the Chapin machine since the frame is constructed with aircraft grade aluminum instead of the steel Chapin frame. Both pieces of equipment use a wedge shaped ground opener – that can be adjusted to the correct depth – to make a furrow for the seeds. The difference is that, while the Chapin 8701B employs a metal spade-like piece as a ground closer, the Earthway 1001-B uses a heavy section of chain – which, in my humble opinion, does a better job covering the seeds prior to being tamped down by the wide rear wheel. 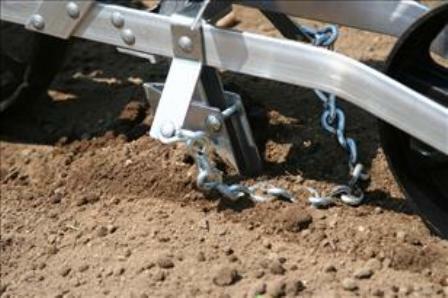 With the Chapin seeder, you will have to walk at a fairly slow pace to ensure that there are no skips in seed placement. But, the Earthway 1001-B allows you to move along at a normal walking speed – so the planting goes a lot more expediently. 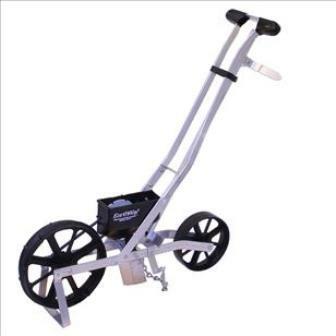 A kickstand on the front wheel holds the garden seeder upright when not in use. But, rest assured, it won’t keep the seeder from toppling over in a strong wind. Finally, a 36 inch adjustable row marker can be attached to the side of the Earthway 1001-B to mark the next row to be seeded. Personally, I think these row markers just get in the way and I never use them. An optional side-dress fertilizer attachment can also be ordered for this Earthway seeder. 18100 – Plants most varieties of sweet corn and other larger seeds spaced 7.2 inches apart. 18101 – Will plant radish, leeks, spinach, asparagus, and other seeds that are about 0.175 inches (4.4mm) in diameter – with 3 inches of spacing between seeds. 18102 – Handles lettuce, turnips, endive, carrots, onions, tomatoes, and other seeds 0.125 inches (3.2mm) in diameter – with 4.5 inches between seeds. 18103 – Accurately plants beans, peas, and other seeds up to 0.450 inches (11.4mm) in diameter – spacing the seeds 3.6 inches apart. 18104 – Works well with jumbo peas and early June peas 0.562 inches (14.3mm) in diameter or less – leaving 3 inches between seeds. 18105 – This plate is great for beets, okra, Swiss chard, and all medium seeds a quarter-inch (6.3mm) in diameter – putting them at 3.6 inches apart. 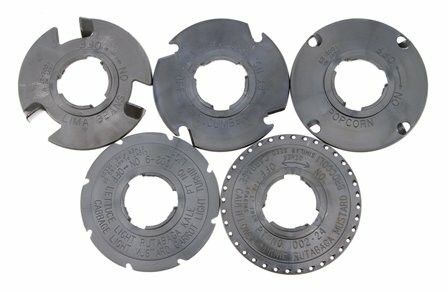 These standard seed plates, part number – 60009, can also be purchased as a backup set. 18108 – Good for planting light carrot, lettuce, turnip, rutabaga, cabbage, mustard, kale, and other small seeds 0.150 inches (3.8mm) in diameter – with 4.5 inches of spacing. 18109 – Great for broccoli, mustard, cabbage, cauliflower, turnip, rutabaga, and tiny seeds less than 0.100 inches (2.5mm) diameter – with 1 inch space between seeds. 18110 – Plants cucumber, gourds, squash, some pumpkin, and other flat seeds 0.312 inches (8mm) in diameter – leaving 9 inches between seeds. 18112 – Use this one for popcorn and other medium sized seeds less than 0.250 inches (6.3mm) diameter – with 9 inches between seeds. 18124 – Very useful for planting lima beans, peanuts, and other large seeds 0.625 (15.9mm) diameter – spaced a foot apart. If you would like to buy this optional set of 5 plates, you can do so here: part number – 60010. It is easy to double the seed spacing by filling every other seed cup on a seed plate with bees wax. Directions are included in the user manual. Since the seed plate makes one complete revolution every 36 inches that the seeder travels, that means if the seed plate has 12 cups, seeds will be placed at 3 inch intervals. If you want the seed intervals to be 6 inches, then block off every other cup. 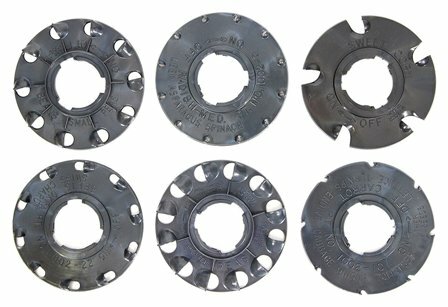 Earthway also has a blank plate (#18106) available with instructions on how to drill it out and customize the cups using bees wax candles – if you’re really handy with making these types of modifications. This might be advantageous if you are planting super large seeds – or, if you have a unique seed spacing requirement. If you still need a custom seed plate and don’t want to make one yourself, you can special order a custom seed plate (#18107) from Earthway and they will special make it based on your seed size and spacing requirements. Plan early, though, because it takes 2 months to complete. When using any garden seeder with vertical seed plates, it helps to slightly lean it to the right – to keep the seeds against the rotating seed plate – making it easier for all of the cups to catch the seeds and avoid skips. To me, a very telling rule of thumb is a machine’s warranty. The better the warranty – the better the machine’s quality. The Earthway 1001-B has a 5 year warranty – as opposed to a modest 1 year warranty for the Chapin 8701B. That tells me that the Earthway garden seeder is a much higher quality unit and is worth a few more dollars. FIX: You may be filling the hopper too full. Lessen the number of seeds and give it a try. Also, if you dip the seed plate in soapy water and let it air dry, it makes the plate more slippery and discourages seeds from sticking to it. You can even use some mineral oil instead of soapy water. WARNING: Don’t use Armor All or WD-40. These lubricants could contaminate the seeds. FIX: You may be using the wrong plate. Even though the plate may be labeled for that specific seed – if the seeds are too much smaller than the seed cup, more than one seed may be trapped and deposited each time. Try to “size categorize” your seeds before planting and choose the seed plate size that accommodates just one seed at a time. FIX: These types of tiny seeds are best sown using a broadcast spreader. The Earthway 1001-B Precision Garden Seeder is perfect for home gardeners with at least a thousand square feet of growing space. Give it a try – you won’t be sorry! For more information, hop over to Garden Seeder Reviews. You’ll get tips and tricks, as well a look at other great garden seeders. Leave a comment or email and let me know about your experiences with planting seeds in your garden. Stories and anecdotes are also welcome. It is always good to know about garden tools that make planting an easy task and also prevent back pain. 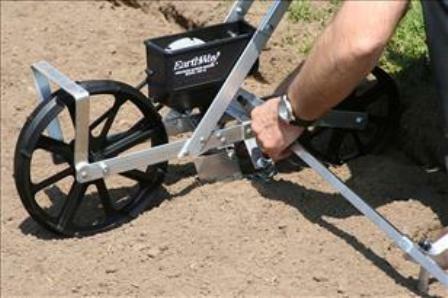 I have never used a tool that helps me plant, but the Earthway 1001 sounds like a good tool. If it allows me to walk at a normal pace it is even better. I like the idea that it is light even better. I won’t have to strain myself carrying it. I can also save seeds for the following year. You are absolutely correct! The Earthway 1001-B is a great little garden seeder that will save tons of time and energy for getting those seeds into the ground. There are also some other options such as the Hoss HGS051 and the Chapin 8701B that are showcased on my Garden Seeder Reviews page.